One of the simplest ways to start playing the game of poetry is with my Slurp! Slop! Slip! method. Here's how it works. Put some words in your mouth. Roll them around like gumballs. Roll them on your tongue. Don't be afraid to work up a little spit. And that's how a poem begins. Think of an image that fascinates you, a subject that intrigues you, or a character that inspires you. 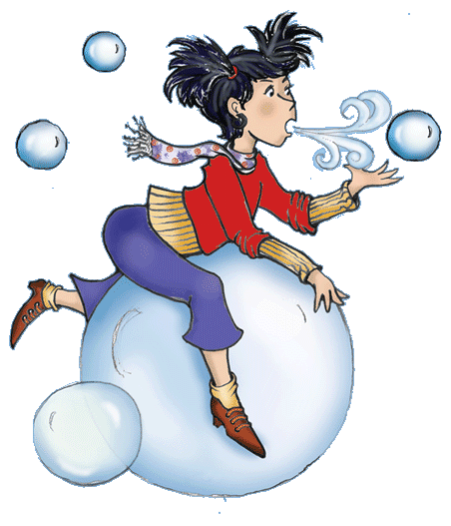 Many things can prompt a poem - a special place, a treasured object, or maybe the vision of a girl floating on a bubble will get you slurping. Make a list of words and phrases that pop into your head when you think about your subject. Include sights, sounds, actions, feelings, people, and places. Don't sweat the spelling. Don't look for rhymes. Don't edit yourself in any way. Just write- slop it on! Now select a few words that capture your attention, and begin rolling them around on your tongue. You're looking for playful combinations, interesting or strange expressions. Don't worry if your lines don't make complete sense. As Willy Wonka once said- "A little nonsense now and then is treasured by the wisest men." Step 4: All Together Now! Once you've created some lines, have some fun putting them together in playful ways. Feel free to add words that aren't on your list or change words that are. Don't get hung up trying to rhyme, but then again, don't shy away from a good one. Hook one line to another, then to another, and soon - poetic bliss. From the heat starts to hiss. Blows bubbles with a kiss.